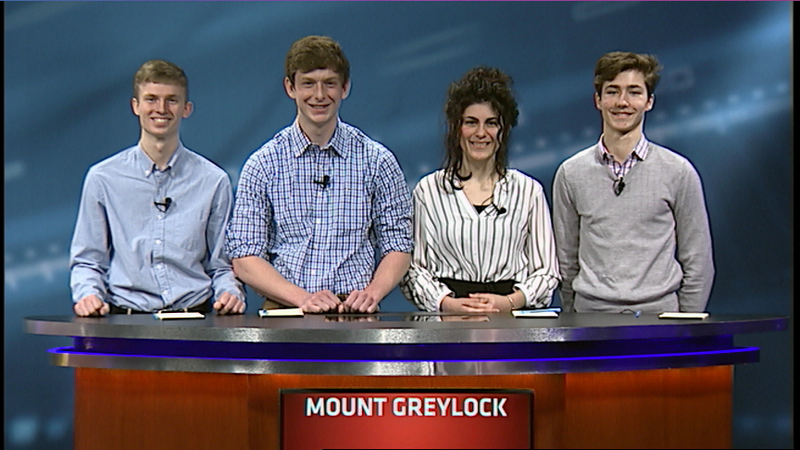 Two teams, Mount Greylock Regional School and Wahconah Regional High School, will spar on As Schools Match Wits, airing on WGBY public television Saturday, April 20 at 7 p.m. (rebroadcast Sunday, April 21 at 10:30 a.m. and available for subsequent online streaming at video.wgby.org/show/as-schools-match-wits). As Schools Match Wits (ASMW) pits teams of western New England high schoolers against each other in a fun, but competitive game of academic performance. The competition is open to both public and private high schools throughout western New England. Each season, up to 50 schools go head-to-head in qualifying matches to see which team can earn the greatest number of points. The eight highest-scoring teams of the season then compete in playoff matches to determine the season’s champion, which is then awarded the coveted Collamore Cup, named for the show’s creator. Quiz shows like ASMW represent an original type of “reality television.” Everyday people play a game testing their everyday knowledge — and viewers love to play along. As Schools Match Wits adds a unique characteristic: local teen contestants from area high schools. If you ask ASMW host Beth Ward, the value of the show is multifaceted. ASMW is a collaborative production of WGBY and Westfield State University (WSU). Produced using Westfield State University facilities, students in the Department of Communications serve as the production crew. WGBY supplies the professional producer, broadcast, marketing, and technical support. Broadcast weekly during the school year on WGBY, questions for As Schools Match Wits are written by longtime ASMW writer and judge Dr. Todd Rovelli along with WSU faculty and students in accordance with Massachusetts and Connecticut state high school curriculum guidelines. WSU's Mark St. Jean of the Department of Communication and WGBY’s Tony Dunne serve as executive producers. For Dunne, the 58th season feels like homecoming. Dunne and his WSU colleagues have “fired up the ASMW machine” and have already begun prepping new questions, lining up teams from area schools, and setting up the tournament schedule.